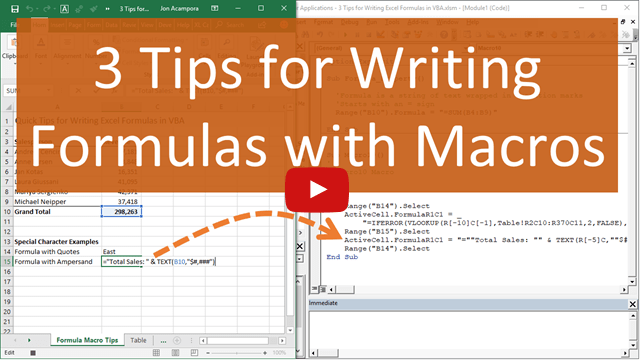 Bottom line: Learn 3 tips for writing and creating formulas in your VBA macros with this article and video. Writing formulas can be one of the most time consuming parts of your weekly or monthly Excel task. If you're working on automating that process with a macro, then you can have VBA write the formula and input it into the cells for you. Writing formulas in VBA can be a bit tricky at first, so here are 3 tips to help save time and make the process easier. The Formula property is a member of the Range object in VBA. We can use it to set/create a formula for a single cell or range of cells. The formula is a string of text that is wrapped in quotation marks. The value of the formula must start and end in quotation marks. The formula string must start with an equal sign = after the first quotation mark. Here is a simple example of a formula in a macro. The Formula property can also be used to read an existing formula in a cell. When your formulas are more complex or contain special characters, they can be more challenging to write in VBA. Fortunately we can use the macro recorder to create the code for us. 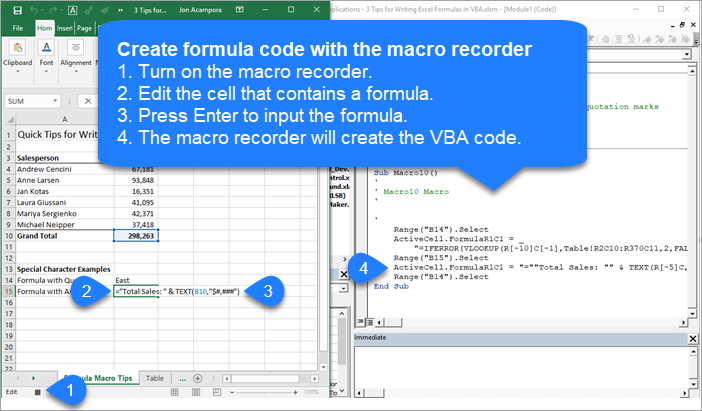 Here are the steps to creating the formula property code with the macro recorder. Type your formula or edit an existing formula. Press Enter to enter the formula. The code is created in the macro. If your formula contains quotation marks or ampersand symbols, the macro recorder will account for this. It creates all the sub-strings and wraps everything in quotes properly. Here is an example. ActiveCell.FormulaR1C1 = "=""Total Sales: "" & TEXT(R[-5]C,""$#,###"")"
If you use the macro recorder for formulas, you will notices that it creates code with the FormulaR1C1 property. R1C1 style notation allows us to create both relative (A1), absolute ($A$1), and mixed ($A1, A$1) references in our macro code. R1C1 stands for Rows and Columns. For relative references we specify the number of rows and columns we want to offset from the cell that the formula is in. The number of rows and columns are referenced in square brackets. The following would create a reference to a cell that is 3 rows above and 2 rows to the right of the cell that contains the formula. Negative numbers go up rows and columns to the left. Positive numbers go down rows and columns to the right. We can also use R1C1 notation for absolute references. This would typically look like $A$2. with mixed references we add the square brackets for either the row or column reference, and no brackets for the other reference. The following formula in cell B2 would create this reference to A$2, where the row is absolute and the column is relative. When creating mixed references, the relative row or column number will depend on what cell the formula is in. It's easiest to just use the macro recorder to figure these out. The FormulaR1C1 property reads the R1C1 notation and creates the proper references in the cells. If you use the regular Formula property with R1C1 notation, then VBA will attempt to put those letters in the formula, and it will likely result in a formula error. Therefore, use the Formula property when your code contains cell references ($A$1), the FormulaR1C1 property when you need relative references that are applied to multiple cells or dependent on where the formula is entered. If your spreadsheet changes based on conditions outside your control, like new columns or rows of data are imported from the data source, then relative references and R1C1 style notation will probably be best. I hope those tips help. Please leave a comment below with questions or suggestions. I have an issue with recorded formulas which is too long to stay in one line. Once I moved the part of the formulas to the second line, the quotation mark popped up at the end of the first line. The error message showed up as Compile error: Expected: ). I tried to add – it & _ to the end of the first line but still got error message. I wonder if you have any solutions that may help. Well I’m sure I’m doing something really dumb with regard to syntax, although I’ve tried every permutation I can think of. This program will read through the data in UsedRange until it sees an empty cell (I realise my counter needs to be recalibrated, not important at the moment). The starting point and end point are present as integers with the variables i and n. These are converted to strStartPoint and strEndPoint, which are both used to produce a string that is the formula I want entered. I’ve tried creating a string variable that contains the entire formula and just inserting that into the cell, but because it contains the = sign, it inserts a boolean result in the cell. I would much appreciate any advice about how to do this. I’ve tried using .value =, .formula =, and at no point can I come up with a syntax that allows me to input this formula as I want. I am the beginner of Macro and don’t know anything about coding, but I need to learn it due to my work. I am using the Index function and want to keep the first 2 Tab of the spreadsheet, however, I can only keep the 1st tab of it. I’ve tried the 3 tips you gave but none of them is working. I think my formula might be too long and that is why I’m allways receiving a runtime error 1004.Can you please advice me ? your =IF(B2=””;””;IF(… that should be 4 double quotation. Can we create a formula that divides cell that is dynamic depending on where the active cell is located? My problem is that I always want the formula range to end with R[-1]C but I also want it to start with A2. Is there a way to do this. Those two lines are going to produce the same result. The major difference between the Range.Formula and Range.Value properties is when we use them to Read values back into VBA. If we want to get/return the formula in a cell then we can use the Formula property. The Value property will return the result of the formula that is displayed in the cell. When we are using Formula or Value to write the string to the cell, then the results will usually be the same. I say “usually” because I’m not 100% sure that the results will always be the same. I think those would be rare cases with number formatting if there were differences. I like to use the Formula property just to make the code easier to read and/or search, but that is mostly personal preference. I hope that helps. I have below value in cell and i want to calculate that value in the next column, could you please help me?? I want compute time inside bracket and the output should be total time(9:30). 15 years ago I used Clipper (under DOS) program, and now I’m learn Macro. The result from this code : var1="YES" , var2="YES" ……var10="YES"
My formula is an array formula that needs to have named ranges changed when I create a new sheet. For example, the I need is an array formula that contains a range that is named data6. When I create the new month, I need to rename data6 to data7. I have been doing this manually each month, but there are 7 cells, each with different formulas that need to be changed. Failed VBA attempts: Earlier code has already set monNum to the number of the current month. rng1 is dim as String. I’m sure it has to do with how I’m referring to the named ranges, but stumped as to how to do it. You are on the right track here. The variables will NOT be wrapped in quotes since they are evaluated in the VB Editor. However, the rest of the formula does need to be wrapped in quotes. The variables and strings are joined together with ampersands. Here is an example where rng1 is a variable that is declared and set in the macro. "=SUM(" & rng1 & ")"
Notice that after the variable we have another ampersand and then text wrapped in quotes. This same technique will apply to your formula. Join the text after the variable with an ampersand and quotes. How can we run macro for a range of cells instead of one cell? -We want to copy all formula for not only B3, but B3:B12. How can we do that? When using R1C1 style notation you can apply the same formula to all the cells in a range. Here is an example. That line of code would put the same formula in each cell. The formula in cell B3 would evaluate to C3+D3. The formula in cell B4 would be C4+D4. If you already have a formula in cell B3, then you can just copy it down to the rest of the cells. There are many ways to do this, but here is one simple line of code using the Copy method. Checkout my article on 3 Ways to Copy and Paste Cells with VBA Macros + Video for more details on these techniques. Can you please explain on what you say on the top? You are saying same thing but one creates error and one not! If you are using R1C1 style notation in your formula text, then it is best to use the FormulaR1C1 property. The following line uses R1C1, but uses the Formula property. That line could result in an error if you have mixed references. Most of the time VBA will figure it out and still convert the R1C1 to cell references. As the formula gets more complex then it might not be able to convert it. Therefore, it’s best to use FormulaR1C1 when you have R1C1 references in your formula text. Can you help me to understand and resolve that? You could declare a variable to hold the last row number. Or use the Row property of lCell. Then use the variable in the formula string. Concatenate it with the ampersands. Here is an example. Range("A4").Formula = "=SUM(B4:B" & lCell.Row & ")"